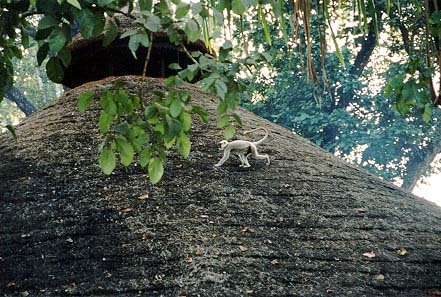 Upon arriving at Tiger Tops, we saw several langur monkeys sitting in the treetops and walking around the grounds. They got a bit scarce after all the polo people showed up, but every once in a while we caught glimpses of them. 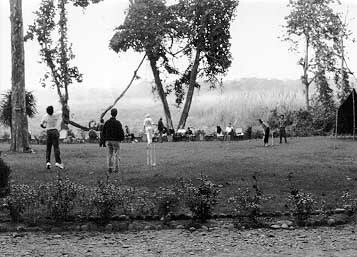 Later in the week, some of the people played a game of cricket (now THATs a strange game - they just run back and forth from home plate to the pitchers mound) with a tennis ball, which kept getting lost in the tops of the trees. I thought they should train the monkeys to throw the balls back, but apparently the monkeys have a huge stash of tennis balls in some secret spot in the jungle. Maybe extortion will work. Remind me to bring several bunches of bananas with me next time. The first two mornings we were at Tiger Tops, I woke up at my customary early hour of 5:30 or 6:00 and went exploring a bit before the sleeping polo players woke up. (The other mornings I was up already, having chosen to forego sleep for the rest of the week). Dawn is certainly my favorite time of day; even more so at Chitwan than in the rest of the world. There is an unearthly quality about the sights and smells and sounds. The sun isnt seen to come up because the mist is thick everywhere, so it just gradually gets lighter and lighter. It sounds like its raining because the water from the condensed mist drips continuously from all the trees. Dewfall. A new concept for me. The first morning I wandered down to the helicopter pad, hoping to get a glimpse of the wildlife through the mist. I interrupted the grazing of some beautiful spotted deer. Some of them left when I came but some of them stood staring at me for the longest time. It looked like they had big ears, but I suppose they were antlers. After staring at each other for about 10 minutes, the last deer made the strangest noise at me and then retreated into the tall grass. At first I thought it was a barking deer but when I later attempted to reproduce the sound for Chuck McDougal, he told me it was a spotted deer. Its more of a squawk than a bark. Ive never heard a deer squawk before. They should be called squawking deer. Well, maybe not. When I went to get more coffee that morning, Asha was up and told me that it probably wasnt a good idea to sit there when its misty because the rhinos come through the mist and you cant see them until its too late. Oops. The significance of that comment didnt really hit me until later on Nigel Mossop told me that three Chinese tourists had recently been gored to death at another resort by an angry mommy rhino. Yikes! I said. A few mornings I wandered over to the bird blind, a wooden structure built up off of the ground overlooking a little pond. I didnt see many birds but the sounds from them were coming from all around me. I heard what sounded like a rooster, as well as several duckish noises and who knows what all. Apparently, birds are almost never seen from the bird blind but its a nice place to relax and contemplate the beauty and the sounds of the jungle. The second morning, Cameron and I saw a mother rhino get up from the field in front of us and wander off into the grass with her calf. Pretty exciting. Those beasts have some armor on them. I love it. I want some. If I had that armor I could sit on the helicopter pad in the mist. After the first day of polo, when my out-of-shape muscles were so sore I could hardly move, someone suggested we take a strenuous hike up out of the jungle up into the sky up over the mountains ten thousand feet high (sorry, Dr. Seuss) to a place called Black Rock. I wanted to be a good sport, but the prospect of this was a bit daunting. Margie McDougal suggested taking a less strenuous walk, and I thought that was a good idea but the die was cast and off we went with our walking sticks and our very nice guide, whose name I dont remember, at 2:15. The hike was very pretty, but very strenuous. Straight uphill most of the way. My heartrate must have accelerated to about 300 beats per minute. Christy got downright dizzy. We saw some interesting things along the way. Mostly monkeys. The langur monkeys are the most common - those were the one we saw when we first got to Tiger Tops - fairly big and gray and attractive, as monkeys go. 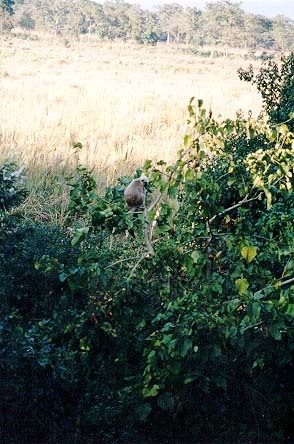 During the walk we saw the smaller, more rare ones - macaque monkeys. They sit in the treetops and drop leaves on people. Theyre pretty funny. We also saw some tiger tracks. Real ones. Big ones. And a tree which had been marked by a tigress. It smelled like tiger. Not particularly responsive. He then mentioned that three shepherds had been recently attacked and killed by a tiger - all in one night. He put our minds at ease, though, by explaining that the tigers didnt actually eat the men, it just killed them. We saw a lot of termite mounds on the way, too. They were cool. The guide explained that they were a primary food source for the sloth bear, whose lovely droppings we saw, but who did not make an appearance for us. We walked to the top of the mountain and sat there for a few minutes enjoying the spectacular view of the river, the fields of elephant grass, the fields of mustard, the surrounding mountains and India not too far to the south. It was there that we discovered that the mountain Alf had convinced us was Mt. Everest was not actually Mt. Everest. So we renamed it Mt. Alf. It got very dark walking back down the hill. We were tripping and stumbling on rocks and I noticed that at some point the guide started making a lot more noise with his stick. Hmmm. I restrained myself from pointing this out to Patty. When the sun goes down in the Chitwan it gets very cold. But on this night I was sweating after all of the exertion. Alf had just gotten there after his boat ride. We took our drinks outside and watched the people coming and going, listened to the sounds of the birds and critters and people laughing. On December 7th, the day after we started our game with the Mercenaries late due to the political protest, we had to make our way back to the lodge fairly quickly because we had a 2:15 appointment with some elephants. This was our afternoon for an elephant safari. 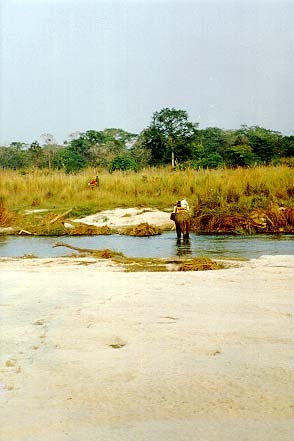 I sat with Alf and Jean and Marya, while Patty, Annie and the boys were on one elephant and Christy rode with James and Patricia Manclark on another. Our elephants walked slowly through mud up to their kneecaps (do elephants HAVE kneecaps?) and water and elephant grass. A very relaxing thing to do, although its a little difficult to take video when youre being jostled around on a big elephant. We saw a mother and baby rhino in a clearing - probably the same ones Cam and I saw in the morning. That baby is so adorable! I think all babies should have armor. We also saw a gaur, a huge thing with Viking horns. Apparently theyre pretty rare. No tigers on this excursion but we did see big tiger prints in the mud close to the river. Lots of monkeys in the trees, of course. Perhaps my favorite moment of the week, both for the wildlife experience and for the pure magic of the place happened on the morning of (or the morning after, depending on how you look at it) the battle for 8th place. As dawn was sneaking up on Chitwan, we embarked on a brief but soul-kindling journey. 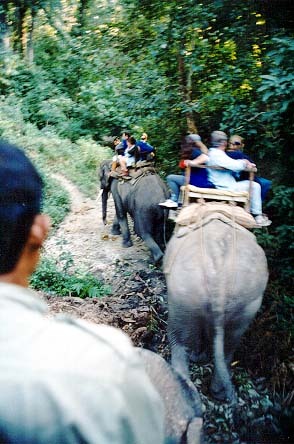 We sat on the elephants without the encumbrance of the big noisy wooden cage they usually put on the elephant to keep the tourists from falling off. I just held on tight to a rope that I hoped was securely attached to the elephant. We moved on tiptoes in the mist through woods and stream and elephant grass, up mudbanks, down tiger paths to mysterious places, under trees and over rodent holes. It was truly a moment of quiet magic during which I realized that I had lost all perspective on time and space and felt nothing but the peace of the jungle and the rhythm of the elephant. The only sound to be heard was the grass giving way to the elephants gentle footsteps and Celine Dion serenading the abundant wildlife. And the wildlife was truly abundant. The tigress, drifting off to sleep in the grass after a long night of stalking monkeys, caught our scent as we slipped past her and briefly considered dessert. A family of rhinos, hearing Celine singing naughty French songs, swayed together in the mist, barely moving the grass which hid them. The gharial watched our elephants drink from the river and started to slink toward us, but had a change of heart when the elephant calmly emptied her bowels in the river. The elusive gaur nibbled on grass just a few feet from us in a small clopse of trees standing admist the elephant grass. The leopard munching on a tasty Himalayan squirrel paused to watch the big feet padding through the mud. As we came back through the woods, the monkeys picked a few special leaves to drop on our heads but they too were taken aback by the gentle grace of our jumbos and forgot their mission. Even the peacock had to catch his breath when he saw us tiptoe by. OK, OK, this wildlife was actually somewhat beyond my five senses. But the elephant did poop in the river and the misty silent ride was so spellbinding and dreamlike that I just know we were being watched from all corners of the jungle. Back to the wildlife that was well within sensory perception. 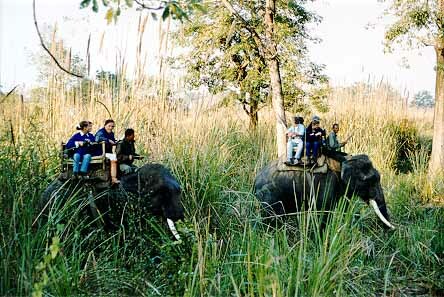 As the elephants headed toward their home, the whole place was treated to the battle cry of one of the more rare species of wildlife at Tiger Tops, Jon Titley, blasting God Save the Queen and yelling Wake up you bastards! ! and something about a 7 day workweek as we proceeded past the lodges and the British Ambassadors quarters and on to the Gurkha camp. Needless to say, this was one wildlife experience the peacefully sleeping polo players could have probably done without. It seemed to those of us wandering on giant beasts through the dewfall, however, to be a perfectly fitting way to start the day.